During the development of the project plan, during the estimating process and during scheduling, experienced personnel can predict risk based on previous projects. Risk is inherent in the development of estimates in terms of time and cost, in scheduling in terms of cost and in the plan overall in the determination of scope and resource requirements. Risk stems from current and known circumstances. What is required then, in conjunction with an estimating and project planning tool such as MS Project, is a tool to collect and record this risk information as it occurs to estimators and planners. Known Knowns: The things that we know about are, for the most part, mitigated for in the project plan. We know from experience or circumstance that these issues will come up and we plan for them in our estimates of time, costs, resources and materials. It is relatively easy to plan these things as we know that we will be addressing them in the future. A good project plan will already incorporate these risks into it. Sometimes, the variability is significant, and we incorporate these into an initial risk management plan. Unknown Knowns: There are risks that we mitigate and plan for unconsciously. They can be built into our company processes, ‘the way things have always been done’; things that we know about and have mitigated for in the project plan but are unrecognized as risks. 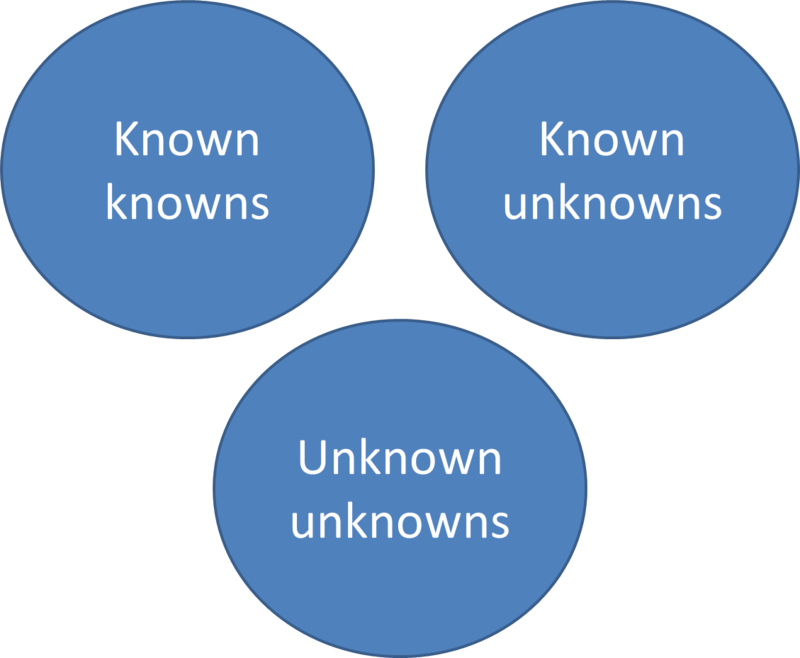 Known Unknowns: There are areas in a project estimate, plan and/or schedule, that have uncertainty associated with them. These areas of uncertainty are the known unknowns and are the most significant part of the risk management process. We know we do not know what will happen, but we want to plan for the eventualities, to minimize bad consequences and maximize benefits. Risk management allows us to do this. Unknown Unknowns : What you truly do not know about as so cannot mitigate against generally comes back to bite. These are outside our realm of experience and therefore ability to predict and mitigate. For more information on how to identify risk and creating a risk management plan, go to riskmp.com or join us in a workshop … across Canada …. Risk Management Workshop.